You've finally made it to Week 4 of the 4-Week Meal-Prep Challenge! And this time, LIVESTRONG.COM and MyHealthyDish are sharing a hassle-free snack combination that's ready to grab at a moment's notice. The star of this week's meal prep is the hard-boiled egg, filled with protein and good fats. By containing plenty of vitamin A and vitamin D, the egg also promotes good eye health and strong bones — and packs it all in at only 80 calories. 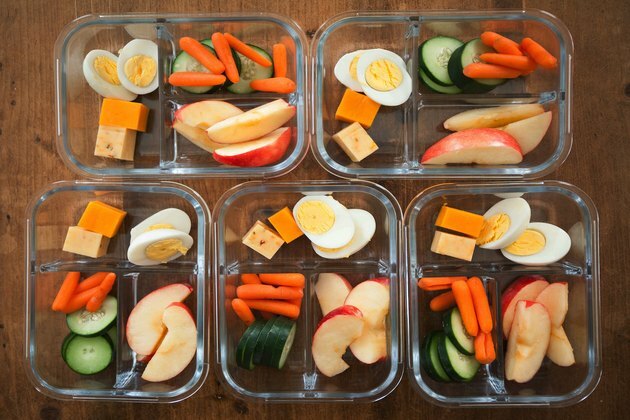 For a balanced snack box, include some decadent (but still healthy) cheese cubes, and add cucumbers, carrots and apples to reach your daily serving goals of fruits and veggies. The entire box has less than 300 calories and is packed with foods that are great for the body and the soul. As long as you have convenient, compartmentalized snack boxes to pack your noms in, filling them up is easy. Take a look at these top LIVESTRONG.COM suggestions, from 100-calorie snacks to fast convenience store options and snacks you can make at the office. It doesn't always have to be raw foods — Sriracha popcorn, for example, is a great antioxidant-rich snack for the days when you're just craving a little something salty. Are you a fan of simple snacks like the ones in this box? What are some of your favorite snack recipes? Please share your thoughts in the comments section.